It’s been one of those mental weeks this week – the ones where you’re never quite sure whether you’re coming or going? Last week of training has flown by though I was more than a little surprised to find myself out on foot beat as one attachment – foot-beat – as in on foot! In this day and age, where we whizz everywhere in our cars, it’s easy to forget that people actually have to, on occasion, walk. It definitely made me feel for all those poor foot officers I can tell you! I limped home 8 hours later with a sore knee and ankle, and a blister the size of a penny on one toe! Definitely an interesting day to say the least. My shifts have been all over this week too so it hasn’t left a whole lot of time for writing. But it’s Sunday now, and as well as my blog, this means writing! My head is full of ideas at the moment for books 2, 3 and 4! I think someone needs to tell my brain to slow down a little as I can’t possibly have all these ideas and be expected to work on them all simultaneously! There’s lots of research prep going to be required, but it’s all in hand! Contacts are on standby and as soon as book 2 is finished I shall be pursuing these ideas! Last time I sat down to pen some words, I was quite happy to leave the story at a crucial point – this helps me refocus and start writing again when I get to sit down. Today I figured I’d start with the blog, as there’s a pan of soup simmering away on the stove and I don’t want to burn it by getting so into my writing that I forget it’s there – it’s easy done you know! Last time I did it, it was a pan of swede! A very poorly pan of swede by the time I realised. Took weeks to scrub the pan clean again! Progress on book 2 is so far approx 41400 words – I’ve done around 3000 words since last blog post which is fantastic. It’s nice being able to put the time aside when I can and give myself the kick I need to get started on it at times. I’m currently leaning towards the altered title I’ve Been Watching You – what do you lovely readers think of that? I’m currently playing with titles, but so far that’s the one that fits the best. I said last week how nice it’s been getting back into the heads of Ben and Jacob, and it most definitely is! It’s also time in my writing to start my time-line as I’m finding myself rereading sections in order to continue! Need my time-line and character spider-gram so it’s highly likely those will get done today too. This week is the week of my Natterbox Dinner Party – 4 of us getting together and having some food whilst nattering and whingeing and what not – it’ll be fab 🙂 could definitely get used to doing dinner parties – I love cooking and the parties give the perfect opportunity to try new recipes! I’ll let you know how it all goes next week. It’s also been a week of potential changes – an opportunity has arisen for me to get back into the field of forensics – it’s too early to tell what will happen, but I have my fingers crossed! I hope you all keep yours crossed for me too! I love how we are all the masters of our own destiny, and how positive thinking can influence our daily lives so much. I only really started believing in the power of positive thinking at the start of this year, but it’s been so great in helping me adapt to changes and accept new opportunities. Last week I said something exciting had happened but I couldn’t say what for fear of jinxing it? Well the truth is it’s not going to jinx anything – you’re all so supportive of my writing and it won’t hurt to tell you now so your positive vibes can help it come true 🙂 For those who are writers, you know how difficult it is to get an agent to even acknowledge you, let alone agree to represent you. And for those who aren’t writers, getting an agent is like finding the proverbial needle in a haystack! I wanted to try going down the route of getting an agent then getting published. I sent a query email to an agent, one of the few who accept such emails, and can you believe that she actually responded! She advised me to send in the required amount of my work, and that once her reader had read it she would read it. This is a fantastic opportunity to work with an amazing agent so I’m really hopeful that it all comes to fruition! But if not, hey I at least got a reply which is almost unheard of! This entry was posted in Blog Posts and tagged author, blogger, crime writer, crime writing, writer, writing on June 30, 2013 by Kerryrichardson77. Another busy week! Almost to the point the blog nearly didn’t get done! But never fear, I’ve found the time. The pic above is one I gathered from internet based means, but it expresses exactly how I feel today. As you all know, I finished editing With Deadly Intent a week or so ago. I quickly set to work on my synopsis – the short, to the point, outline of the novel including the twists and turns. For those not in the know, agents require this as they only request the first three chapters to read. The synopsis provides them with an insight into how the rest of the novel is set out. This took a little while, though I must be honest and say that I found it quite enjoyable. It was an interesting exercise to fit 90k words into two pages but include all of the pertinent points. And believe it or not, I’ve sent this to my first agent selection. They can be quite slow in responding due to the sheer number of submissions they receive, but I have my fingers crossed. It is notoriously hard to pick up an agent, only the lucky few authors attain the elusive status of being ‘represented’. I just felt for me this was the right thing to try first, if it doesn’t work (and I have plenty more to try if this doesn’t pan out!) then I will naturally look to publishers, and then the route of self-publishing. One day my books will be available – this I firmly believe. So Cass and Alex have finally been put to bed, so to speak. Although, we will meet them again in the second novel as secondary characters. I’ve spent today beginning again from scratch with Ben and Jacob, getting back into their minds, and getting to know them again. This novel is obviously different from the first one, in pretty much every way. It is still crime obviously, though I’m really enjoying focussing on the psychological side this time. I’ve rejigged some things I wasn’t happy with and have written a further 1200 words, which is fab since the rejigging took quite a bit of time! I’m excited to realise I have written almost 40,000 words of book two already! Now is the time for focus though, I need to get this one finished as soon as I can, so I can start the extensive research I need for book 3, a brief plan of which I already have in mind. So if I hide away in my office and don’t speak to people over the forthcoming weeks I sincerely apologise, but the need to write is too strong to ignore! It’s also been a week filled with animals! There was a beautiful heron on the fish pond at work the other day, gorgeous creature just out for a free fish supper. My good friend Claire’s parrot decided to have a few days vacation away from home by flying away, but has now returned and is safe and sound, and Claire has also purchased a new puppy! Which is fab cos I get to have puppy kisses and cuddles without actually needing to go through the trauma that is puppy training. A nest of bumble bees has also decided that a good place for them to breed into big bumble bees, is the porch roof above my front door. It’s a good job I’m not allergic to bees as well as wasps! As the little buzzers are flying above my head every time I go in and out of the front door! They’re not doing any harm though, and apparently it’s quite lucky to have them nest nearby. That’s pretty much it for this week, short blog but filled with all the positivity I’m currently full of! This year is going fantastically, and it shall continue to do so! I am choosing to ignore the bright, red soreness that is my index finger as I type this – non-acetone nail varnish remover burns skin, which has then peeled off in a sheet leaving me looking a little like an extra from ET! But it will heal, and a little pain is worth enduring when I’ve done as much as I have today! This entry was posted in Blog Posts and tagged author, blogger, crime writer, crime writing, writer, writing on June 23, 2013 by Kerryrichardson77. After a hugely busy week, the weekend finally arrived! It was actually one of those long arduous weeks where you long for your rest days with all of your being. But not in a bad way. As you all know, I started my new job this week, and it’s been all focused around knowledge and training and computer systems. Now most people who know me understand that whilst I appear tech-savvy on the outside, I’m actually not that great and it doesn’t usually like me. This week however I have had minimal problems. I’m enjoying the new challenges and embracing the new systems which so far appear to be much easier than those I previously worked with. I’m in a small training group, all of whom are lovely and have already been made aware of my future team and shift pattern so I’ve been able to work out the most important thing about any job, my annual leave! Speaking of annual leave, it’s only a month til the Harrogate Crime Festival! EEK! Excited! Today has been a fab day – for my regular followers, you all know I finished the first draft of With Deadly Intent in January – then put it away and started editing in March. My original aim was to finish the editing by the end of May which with one thing and another turned out to be a little ambitious but (cue the trumpets sounding), I have finished the final edit TODAY! All 90,111 words, all 267 pages, all 40 chapters (plus prologue and epilogue!). I am naturally feeling very euphoric at this, or I was until I realised that now I’ve finished the editing, I have to prepare the synopsis, author bio and pitch letters! I have made a start on this, but am finished with it for this evening as have to be up early for work tomorrow. I will of course, keep you all updated as I progress! I am generally a very positive person, I like pictures that inspire and today’s picture was appropriated through internet means – it doesn’t list the author but it’s very apt. I’m by no means perfect, but I work hard both in my employment, and my writing, and there’s just something about this year and that positive mental attitude that is making everything work out. One of my good friends once said that I’m the most positive depressed person she has ever met – I love that. My depression is something that strikes at inopportune times, and can cripple me for days at a time, but I try my best not to let it. Because I believe that depression is just part of life, it doesn’t define who I am and as long as I don’t let it take over my life, then the rest of the time I get to be happy. I firmly believe that in being positive, it helps keep my depression at bay. You may or may not agree, and that’s entirely your prerogative. But it works for me. Now book 1 is finished, I can get it sent out to agents in the next couple of weeks and turn my attention back to Ben and Jacob – I can’t wait to get back into their minds, see what makes them tick, and bring them back to life. Writing is such a big part of my life now, I am eternally grateful to the psychic who asked me why the hell I wasn’t writing, and to the wonderful lecturers (mostly) who brought out my talent and helped me learn to embrace this side of me. I’ve spoken to several people lately who have been very interested to hear I’ve written a novel (wow that sounds good) and many have said back, ‘I’d love to write a book.’ My advice to anyone who believes they would have loved to have done it, is that it’s never too late. Dreams are there so that we can aim to achieve them – one is quite simply, never too old to write. So get that pen and notebook out, start making some notes. Put aside just an hour a week to make sense of those notes and before you know it you’re on your way to writing your first novel. And if I can ever offer anyone advice, or encouragement, please just get in touch. Helping others is the least I can do when I’ve had so much encouragement and help in my career. This entry was posted in Blog Posts and tagged author, blogger, crime writer, crime writing, writer, writing on June 16, 2013 by Kerryrichardson77. Anticipation, Hellos and Goodbyes …. It was an odd feeling working my last day. I will miss some people, but there was a huge sense of relief – I’m moving to another police force which is closer to home, and it feels like a weight has been lifted off my shoulders. I’m genuinely feeling like I’m returning to where I belong – leaving to start anew was definitely the right move! So excited to start tomorrow! Have had a lovely set of last rest days and couple of days between finishing one job and starting the next too. Went to Redcar with mum one day and enjoyed fish and chips on the beach in the glorious sunshine. 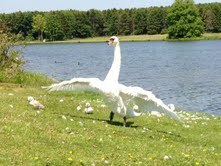 Then had a lovely afternoon out with my husband at Hardwick Park, which is where I took the well-timed image above. Hardwick is a fantastic place, plenty to see but so peaceful and serene. The proud mama swan above had 7 signets! And yesterday I had a lovely morning out with my husband, in-laws and grandparents to Darlington to enjoy the Victorian Celebration which was designed to celebrate 150 years of the covered market. There was plenty to see – a roast ox in the market square, a man making liquorice from scratch, a lady making beeswax candles and so on. It was nice to see how things used to be done. In between all this I have managed to get some more editing done on With Deadly Intent – I am a couple of weeks behind schedule with one thing and another, but getting there. I will hopefully be finished editing this week and can then send off to agents so keep fingers crossed! I will naturally keep you all updated. I’m really excited to get to that stage as it means I can revisit book 2 and continue with that story line – am looking forward to rereading it and getting back into the heads of Ben and Jacob. When I left the last force, I had a small leaving do, and not expecting anything, I was most surprised to be handed a leaving gift. My good friend Michelle had arranged it all, and I received some chocolate to aid with mental thoughts when writing ( 😉 ) an absolutely beautiful pendant, and an angel pin badge which I will put on my new epaulettes (stupidest word ever!) I went in for my last day and received a further small gift of one of my other colleagues too. It was a genuine surprise, and I am most grateful. Then on Saturday morning I received a huge bouquet of flowers from my lovely aunt and uncle wishing me good luck! It’s funny – I’m writing my blog this week and seem to have said loads but it still feels shorter than normal! But I’ve pretty much said everything I wanted to. Dinner party arrangements are in planning for my writing group. It should be held in a couple of weeks but once again, I’ll keep you all updated. Thanks to everyone who reads my blog regularly, and to everyone joining us for the first time. I look forward to writing next weeks and telling all about my first week! This entry was posted in Blog Posts and tagged author, blogger, crime writer, crime writing, writer, writing on June 9, 2013 by Kerryrichardson77.